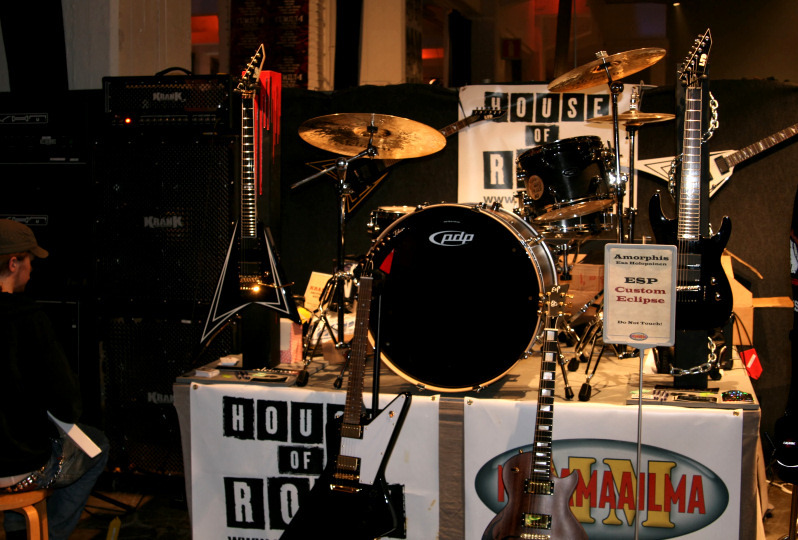 Organized for the third time this year in February, Finnish Metal Expo has gained a loyal crowd from the metal fans going there each year from all over the world. 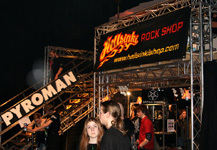 The expo once again offered various highlights for the metal music consumers, like clinics and various stands selling or giving away sfuff for free, but the most important roles were played by musicians themselves, doing different neat things for metal fans like selling t-shirts, as was seen guitarist Sami Lopakka of ex-Sentenced doing. Of course the concerts were what counted the most. Journalists from different magazines always invade the expo too and the rest of the bunch that work in the metal music business. 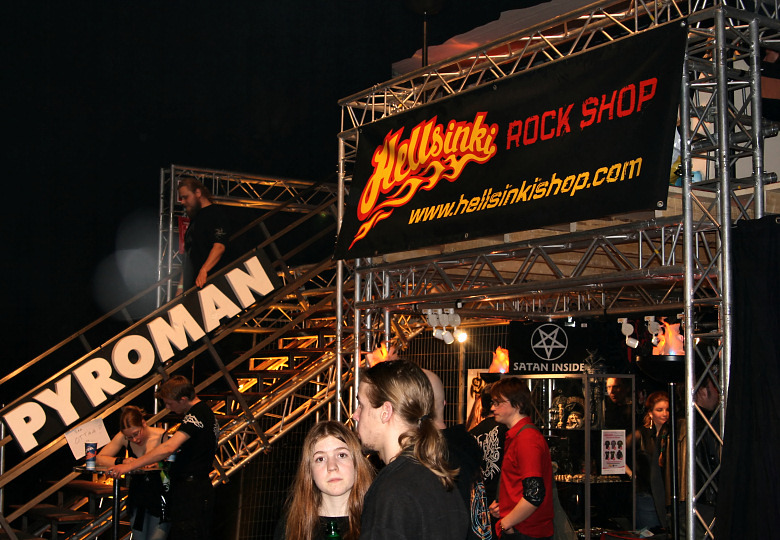 It's not easy to pass such metal festivities, where meeting just about anyone is possible. The event doesn't have agelimits, but still serves its older crowd in limited areas. The expo kicked off this year already on 15th in Tavastia club, where LEVERAGE and TAROT gave a fine evening to those, who love either proggish melodies or powerful metal, both bands with great singers. Tavastia was packed of course, which was no surprise. Tarot has always been pets for Finnish metal fans and Leverage has surprised both the metal fans and the media with their last years brilliant debut. 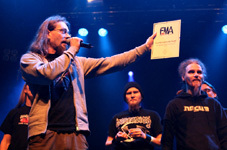 The participants for the yearly International Metal Meeting for FME gathered in Tavastia, as the clubs balcony was closed for normal crowd half the evening. Including the IMM-goers, the balcony also gathered the cream of Finnish musicians. When Tarot kicked off their set, at least Marco Hietala's Nightwish mates Emppu Vuorinen and Tuomas Holopainen were seen enjoying the show upstairs. Tarot played the sort of set they've been playing in Germany lately, and it didn't please all Finnish Tarot fans, who go for different songs. 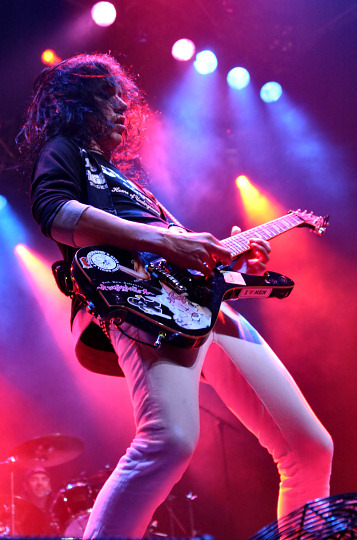 Personally thinking Tarot doesn't really have much average songs and they still had their usual energy present on stage. As for Leverage, their shows are as professional as Tarot's, and even on a bad day their fans are still pleased of what they've seen and heard. This band hasn't been around too long yet to have a big fanbase, but their small crowd feels very strongly towards their music. We'll be hearing more from these guys. As for the FME itself, this years bands were Amon Amarth (SWE), Brother Firetribe, Moonsorrow, Sub-Urban Tribe, Turmion Kätilöt, Coldworker (SWE), Insomnium, Misery Inc., Before The Dawn, Cyan Velvet Project, Tacere, April, Battlelore, DragonForce and Rytmihäiriö. Few of the clinics included shows from the bands too. Tickets for the expo were once again sold per day, the cost for a day was 20-22 euros depending on the day. Saturday was sold out, but Friday didn't fall much behind in sales either. The expo has been a success from the start and it shows in the lines that gather outside the factory each year. There's still improving to do with the event though, and this year had a few things left to improve, like the food and the bar downstairs would definately need chairs. 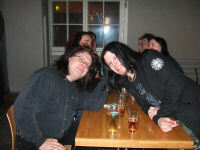 BATTLELORE, MISERY INC. and MOONSORROW had already played their sets, when we rushed to the scene. All of the above mentioned bands are worth seing though, playing powerful metal with stage shows not all can offer. Each year the Finnish Metal Awards (FMA) are handed out, and this year the jury consisted of Inferno, Imperiumi.net, YleX's Metalliliitto and Yle X3M's Metalväktarna, Miasma, Subtv's Rautaryhmä, Jone Nikula from Radio Rock/Finnish Idols and Jussi Ahlroth from Helsingin Sanomat. The consumers themselves picked out the final winners. The awards themselves are always presented with humour and the crowd got a few good laughs this year too. The awards were handed out by Mape Ollila (chief editor for Imperiumi.net, writer of Nightwish-book) and Heta Hyttinen (journalist, announcer). 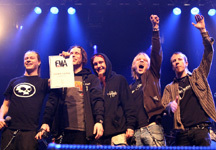 The most prized band turned out to be Mokoma this year, who collected awards with a group hug from; The Album Of The Year (Kuoleman Laulukunnaat) and The Best Album Cover Art (Ville Pirinen). The rest of the year 2006 awards went to Children Of Bodom (The Band), Profane Omen (The Newcomer), Kai Hahto (Wintersun, The Player), Marco Hietala (Tarot, Nightwish, The Vocalist), Pommiradio (The Metal Deed) and Klaus Flaming (Radio Rock, for life-work). 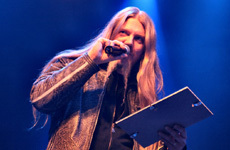 - Marco Hietala picked up his vocalist award again, and stated humourously he's "just yelling". 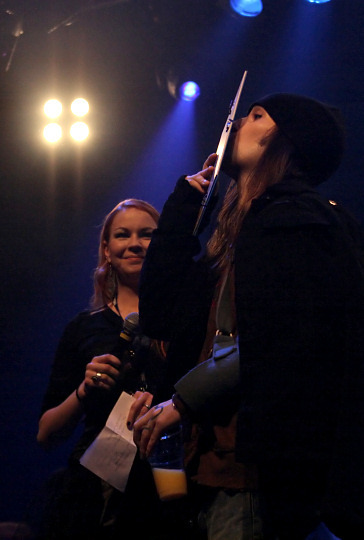 - Nothing new under the sun, but Children Of Bodom-guitarist-singer Alexi Laiho was seen on stage with his hand again in a cast. This time the dude bowled it broken...wonder how that happens, but he must have one helluva technique! - Kai Hahto came on stage a moment earlier he was supposed to. 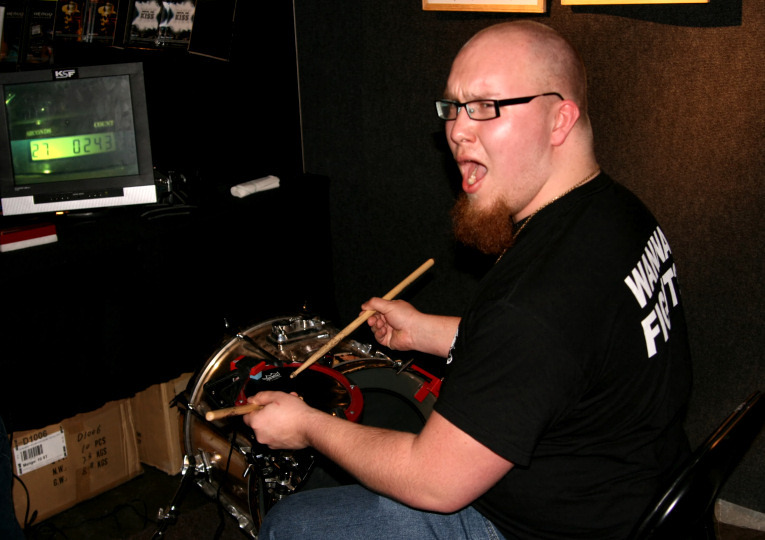 Blame it on his long drumming career they say, he's probably lost some of his hearing. Now what happened to using ear-plugs and all that education on using them? Remember those "Can't Hear You Knocking" -documents with Ted Nugent, Lars Ulrich, Huey Lewis and so on? Take their words folks, losing your hearing is serious. 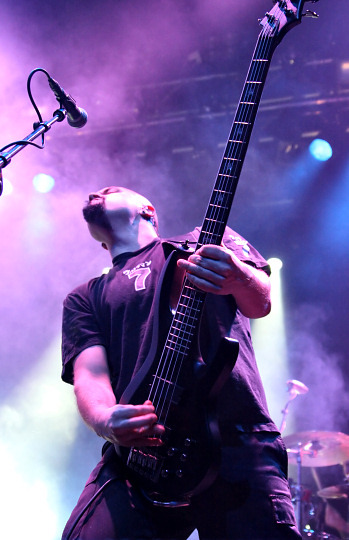 This years expo had an interesting line-up, considering the two tribes, Brother Firetribe and Sub-Urban Tribe don't fit into the heavier side of metal with the rest of the expo performers, so the crowds response to their shows was interesting to see. Both bands include names known in the Finnish metal circles for a long time though, so the crowd didn't give a complete cold hand for the bands. Brother Firetribe was the one to collect the biggest cheers though, mainly because their music works better for younger crowd, while Sub-Urban Tribe entertains in a different league. SUB-URBAN TRIBE, who's lead singer Ville Tuomi is known earlier from a more vivid band Kyyria, sharing the spotlight there together with members from Amorphis and HIM, hasn't changed during his career, and once again he gave the audience what they were expecting from him as the band came on stage after ten o'clock. Tuomi is a singer and performer extraordinaire, of whom many bands can only dream about, being an untiring performer, who has the charisma to take over any crowd. Sub-Urban Tribe is known as a more mellower band though, so watching them on stage one mostly wonders about the force that keeps Tuomi still leading a band, that doesn't fit his energy levels and performance skills. It must be the band chemistry at least, and singing these poppish melodies seems much less distressful than being in a heavier band. Since Tuomi has gained an own fanbase during his long career, not to mention the other fellows in the band, they didn't fall on no enemy laps, but had many fr iends and fans welcoming them on stage. The older crowd mostly stayed in the back of the hall enjoying their drinks and watching the band from there, while the youngsters moshed away to those few heavier songs the band can offer. Tuomi had a good drive behind his performance once again and as the show went on, his clothes started dropping piece by piece, and the mike could hardly stick to his hands. 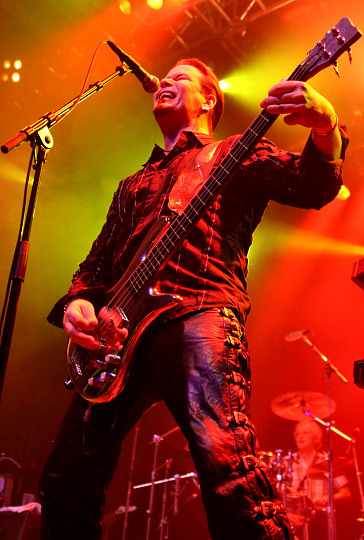 Bassist Janne Joutsenniemi is also a charismatic member, who's long career shows in his powerhouse performance. Sub-Urban Tribe can produce great and profound melodies, that are easily recognized and loved, but there's something in the bands material also, that don't spark as few of their best songs. The crowd wasn't the best one for this band, who's audience mostly consists of the followers of the top ten-lists and whatnot, so the bands attempts to sing-alongs went to deaf ears. The songs drewing most of the attention were of course the ones seen on vids and heard in those top tens and other programs, which included the Finnish Big Brother theme song "While The World Awaits", the Peter Gabriel-cover "Shock The Monkey", "Frozen Ashes" and "Silent Rain". A good show from a talented and confident band, bu t I'm still waiting for them to record something heavier, or at least something catchier. Or hearing their classic sounding, very mellow "First Spring Day" at least in one of their shows, although their singer at the time was Jouni Markkanen, a man now working behind the FME production and many other projects. 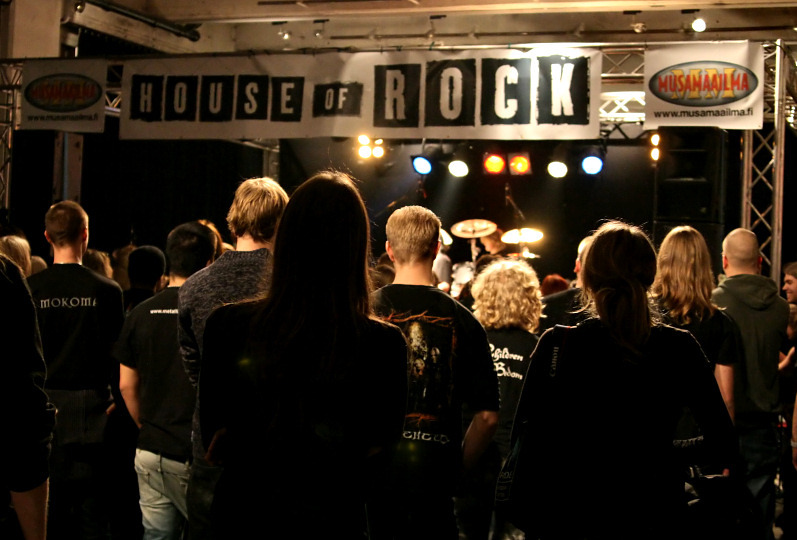 The clinics seen in Valssaamo on Friday were Petteri Sariola Acoustic Experience, Godsplague plays Pantera (feat. 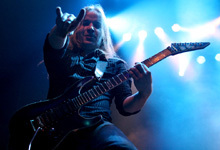 Kai Hahto), Mirror Of Madness and Alexi Laiho & Roope Latvala (COB), and in J-Aula Teppo Velin (Stam1na) , Mikko Kosonen, Sami Yli-Sirniö (Kreator) and Strandberg Experience. We caught the young newcomers in metal, Mirror Of Madness (MOM for short) playing their set, which had drewn in a nice amount of curious people. The show, as seen shortly, hardly amazed, but give these lads a few years and I bet they've got far more better songs than heard here. The crowd always has a chance to ask questions from the band in the clinics, but this section isn't all too popular, strange to say the least. 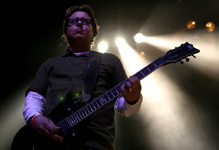 When the crowd finally interacts, they usually tend to do song requests for the band or artist. The clinics work best among the musicians, who are interested in seing the techniques and instruments used. One of the announcers in FME was Jone Nikula, known from Finnish Idols, and he was doing his job like he's always done it, with an attitude that fits right in to an event like this. 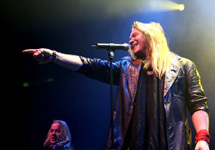 Another familiar Idols face was seen in FME too, Ari Koivunen, who's attracted fans from the metal genre with his metal performances, singing mostly with high vocals, like his idols Bruce Dickinson or Timo Kotipelto. The international band DRAGONFORCE was supposed to visit Tuska Festival last summer, but due to cancellation they now paid the disappointment back performing in FME. 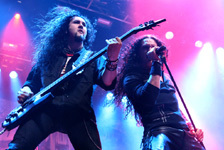 DragonForce has grown very big in a short period of time, thanks to their record label and dedicated fans spreading the word, so it was yet another show worth seing in FME. The guys visited Finland a few years back, but weren't all too well known at the time, so this gig was gonna raise more hell than their earlier one. 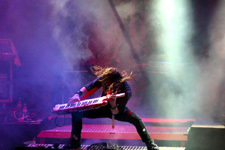 Most of the bands had around thirty minutes on stage, but DragonForce was Fridays main band, so they were on for over an hour. It takes a lot from DragonForce fans to go through their one hour set though, the bands mindblowingly powerful and crazy presence catches like flu to the audience, who can't do nothing else but go as crazy as their idols. The guys didn't bring their trampoline to Finland, but those who saw the band further from the stage could've sworn they had it. The jumps seen from t he band were amazingly high, they must've at least had springs in their sneakers, but no. Here's something for other bands to envy about, not a single metal band has ever performed in such a furiously wacky way. 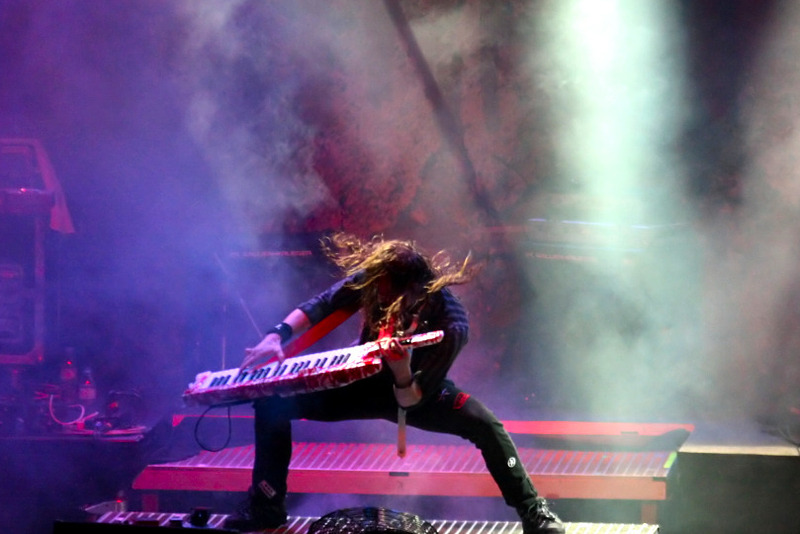 DragonForce has never taken themselves too seriously, which is a big plus for them. A band that has gone through various mishaps has always risen to the occasion and saved the day in any means needed. This evening the crowd saw keyboardist Vadim Pruzhanov do his famous and funny, cheesy yet catchy keyboard solo, which is getting new fans show by show. Some aren't into the solo at all, which is understandable, but it's still one of the most original performances ever seen. 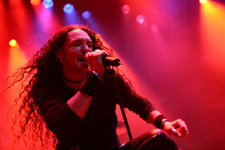 While an average metal band produces one or two charismatic musicians that catch the eye, DragonForce is a case of their own. Each member gives their fans their 100 percent, which makes their show very difficult to follow, if you're weighing between the most interesting performer. 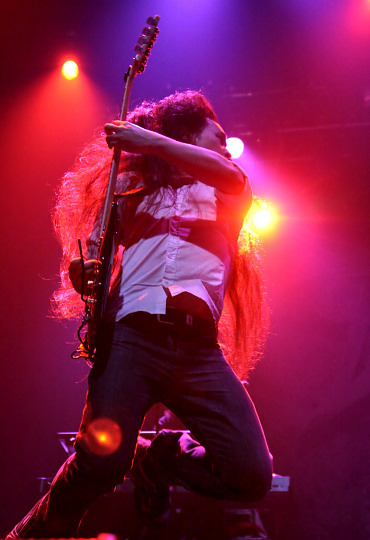 While Vadim is running across the stage like a lightning, you'll probably spot the multi award winning guitarteam Herman Li and Sam Totman either running to the opposite way or doing something else silly, and all that while playing their furious guitar solos and jumping in the air. Of course for Li it's hard to avoid getting his mile long hair stuck between the strings in all the hustle, but the guys go crazy no matter what happens. For a band that performs like these guys, those drink stands and electric fans on stage are a must. Drummer Dave Mackintosh is just the right drummer for this "faster than the speed of light"-band, and keeps bashing his drums with amazing energy and speed. The newest addition in the band, bassist Fred Leclercq, fits in like a glu, he's up stage performing like he's always rambled with the Dragoners. Such a powerbomb show offers so many things for human senses, that a lot of things have escaped my mind after the show. A lot of joking went on though, and most of that was done by Totman, but singer ZP Theart was on the spotlight too. Not all can handle the bands humour though, being very sarcastic and quite black, but most were seing laughing. 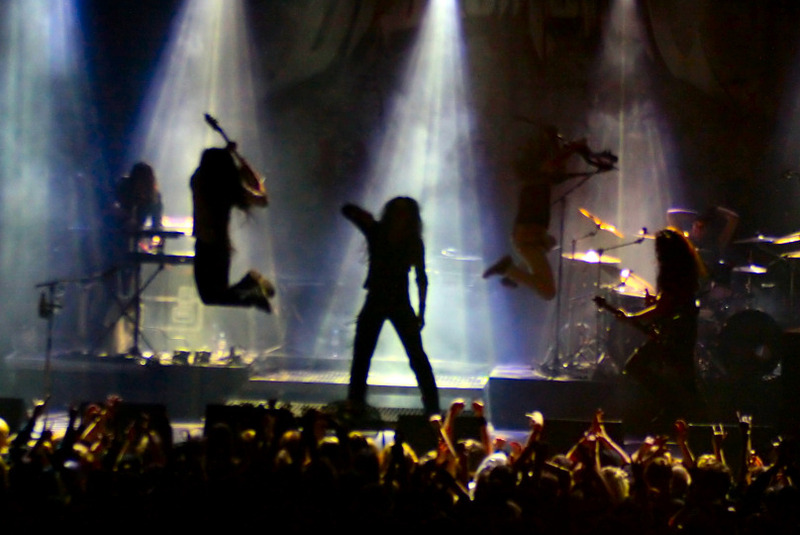 With the talents of DragonForce it's easy to say they're a live band hard to top, also entertaining their musician fans with their skills, on top of all the "normal" crazy activity going on. 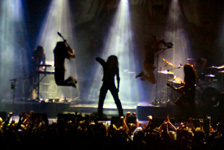 DragonForce, earlier known as Dragonheart, hasn't forgotten their older fans either in the midst of their huge success, and the hot show ended to one of their first ever written songs, "Valley Of The Damned", a damn fast piece like most of their songs, and the crowd was pure melted butter in front of them. Nice wo rk again guys, I guess after the bands earlier misfortunes you could now say "Sweden botched, but Finland rocked!". As DragonForce left the stage, the fans were still screaming for more. Being the last band to perform on Friday most of the crowd left the Cable Factory quite soon after, but the patient ones had the chance to meet DragonForce some twenty minutes aftershow. 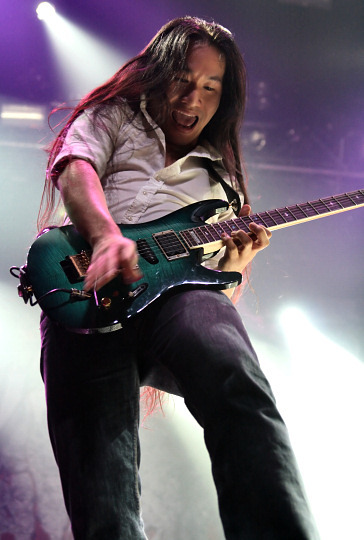 Herman Li was a bit tired, but the guys were still planning on continuing the party somewhere after FME. 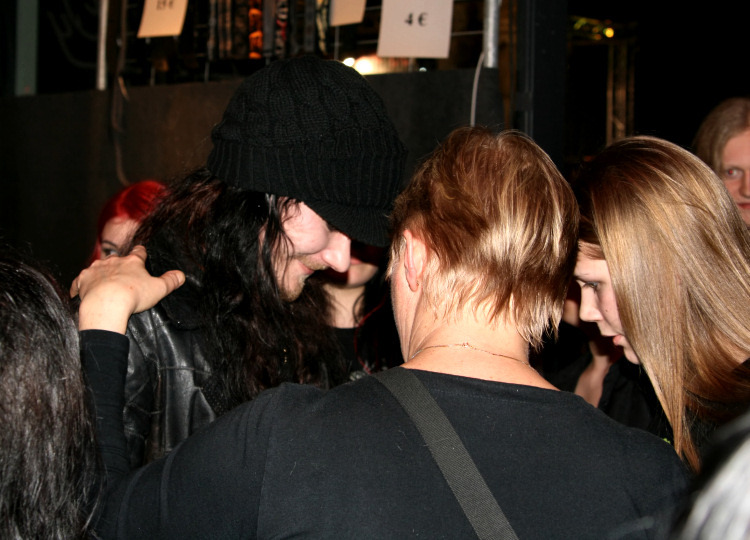 Many fans were eagerly asking them to join them over to the Inferno bar, which was recently opened in Helsinki. The guys didn't make it there though, but with such a tight tour schedule as they've had, it's no wonder a musician gets tired sometimes. Well, those who were still going strong after half two at night were lucky to catch a bunch of musicians in Inferno. Saturday started, well, early for some, late for the rest, and TURMION KÄTILÖT, CYAN VELVET PROJECT, APRIL, INSOMNIUM, TACERE and BEFORE THE DAWN kicked off the day. Turmion Kätilöt is one of the most criticized metal bands in Finland in the vein of Rammstein, and the show offered their fans once again something unforgettable. Cyan Velvet Project and April are still fighting in the small league and don't attract too many fans, but Insomnium has just that type of music that fits very well in the FME bill, just like the dark and melancholic Tacere with their female singer and Before The Dawn, although I haven't still figured out the spark behind BTD or Tacere either. The latter had a debut album release party at FME. 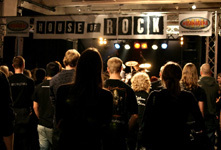 The clinics on Saturday featured Mikko Kaakkuriniemi & Kalle Torniainen, Dame, Emppu Vuorinen & Marco Hietala, Hyrde & Kaikka (Stam1na) & Mokoma, Swallow The Sun, Timo Kotipelto/Lauri Porra/Tuomas Wäinölä/Mikko Kaakkuriniemi Super Show, Heikki Saari (Norther), Antti Wirman & Tuomio, Juhana Karlsson & Erkki Silvennoinen ( Amoral), Heikki Malmberg (Diablo), Kai Hahto & Jaska Raatikainen (Wintersun & COB), so there was lots to pick from, like doing shopping in the stands, which were abundant and very colourful. Among the musicians seen in the stands, on stage and in clinics, you could do a lot of celeb spotting anywhere in the area. One of the most popular FME guests must've been Awa from Lordi though, after their success in the Eurovision Song Contest. 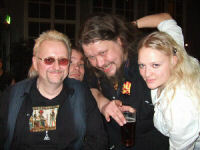 Among all those celebs at FME this year we also caught radio dj-journalist Klaus Flaming and Machine Men singer Antony Parviainen discussing about virginity and whatnot, a deep metal discussion if anything, and a Finnish legend, Sarcofagus-member Kimmo Kuusniemi, all enjoying the FME traits on offer. Also Mika Penttinen, Ismo Karo and Samuel Jylhä were presenting their metal quiz book, 666 Questions About Hard Rock, and were on a good mood. From nine o'clock on there were still four bands performing. 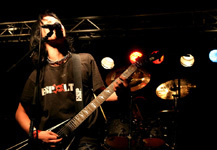 BROTHER FIRETRIBE deserves the spotlight here in RockUnited with their aor-hard rock based music, which we're most specialized in, so we checked them once again. A set that they've played so many times before was again heard in FME, with familiar tennis intro. The bands crowd was very colourful and playing to an audience that isn't exactly the best for Firetribe was definately a challenge. For these guys nothing seems too much though, and they kicked the show off like in any other place, strong and smiling, even when there were painted and gloomy black metal fans gazing at them from the crowd. 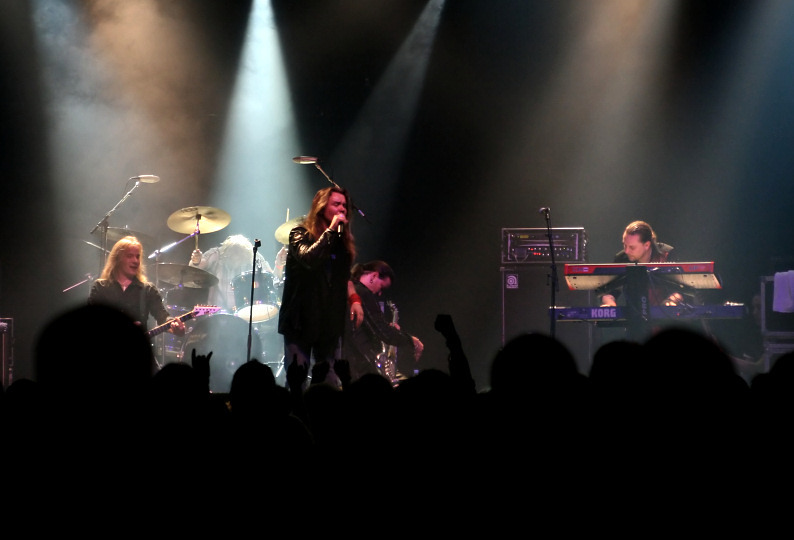 The band came to win here though, and unbelievably even won some hearts among the black metal fans, who were seen interacting with the band and singing along to the songs. 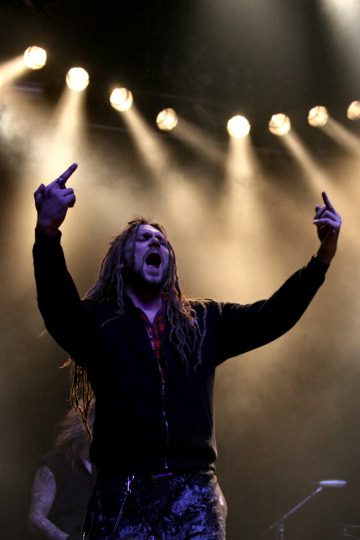 An unforgettable moment, so this years FME saw the genre gap between metal fans disappear. What a rush, eventhough Firetribe didn't pull their best show, but still gained new fans. 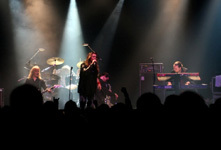 Firetribe's hit "One Single Breath" was once again the most popular track among the crowd, and their newest single "I Am Rock" has fast become another popular tune. The cover song from Cheap Trick, "Mighty Wings", works as powerfully from the band as any other of their own tracks, although the younger crowd doesn't feel as strongly about the song as those, who actually listened to the original in the heydaze. 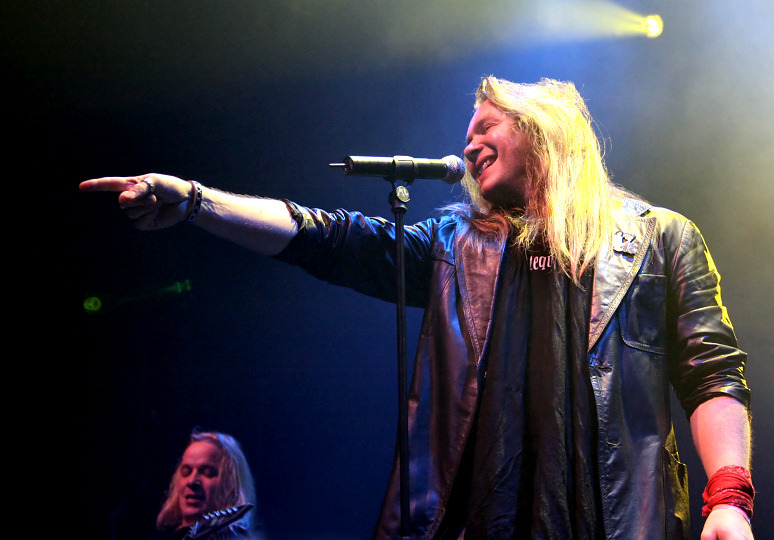 Singer Pekka Ansio Heino wasn't at his best in the show, due to the persistent flu's lately going on in Finland, but Jason Flinck doing the background vocals helped him at his task and the rest of the band did their best at firing great melodies to their fans. 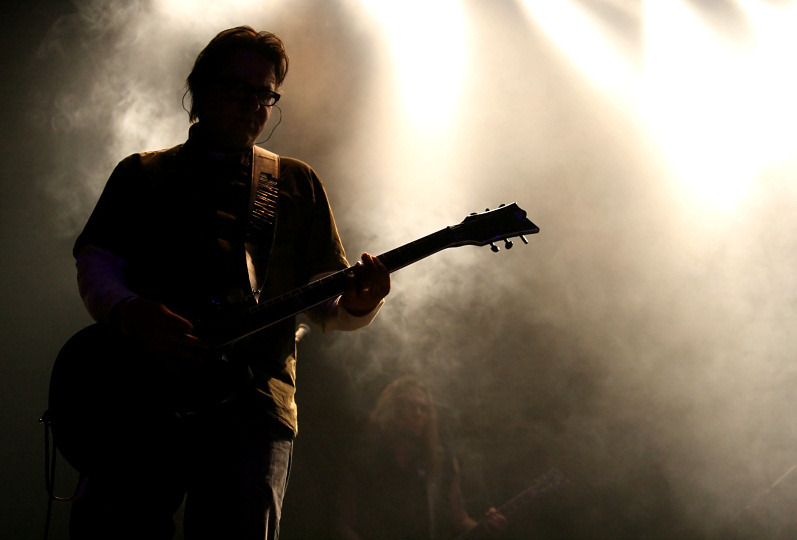 The most important member firing those melodies is of course keyboardist and songwriter Tomppa Nikulainen, who together with guitarist Emppu Vuorinen give depth to the songs with their great melodies and solos, not forgetting Heino's vocal parts. 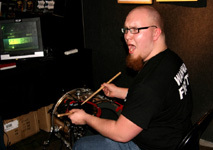 Emppu really gets to shine in this band, which is great to see, an d drummer Kalle Torniainen has finally started seaming better together with the band. Sadly TIMO KOTIPELTO and his band were playing and doing their clinic at the same time with Firetribe, so we only caught them on stage for two songs, an instrumental and Kotipelto's latest release "Sleep Well", which worked live as well as on the album. A small crowd was watching them, at this point people had left to clubs to continue the evening. Kotipelto's band consists of professional musicians, who were with him also last year in FME, so his show was as professional as it can get with these guys and they performed as if they had a bigger audience than in reality, so the show was still captivating. 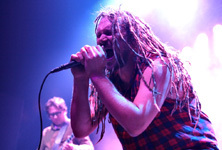 The three bands that played after Firetribe and Kotipelto were in a completely different genre and for that more closer to the hearts of the FME crowd. Coldworker, Rytmihäiriö and the Swedish AMON AMARTH are all brutal bands, either in the death metal or punk genre, so the end of the evening continued in that manner. Amon Amarth is very popular among metal fans, and their show was very pleasing in many ways, very heavy and their stage presence pleased, being in your face and interacting with the fans. COLDWORKER and RYTMIHÄIRIÖ ended the evening, and at this point the late hours were caving in and dealing with the grind core racket and anguish storming from the stage was hard so late. Instead of staying till the end we headed to a more friendly atmosphere, and at the midst of our heavily packed taxi drive the ex-Urban Tale guitarist Erkka Korhonen almost lost his guitar in the cab. What an evening, and fortunately the guitar got rescued.